Happy Friday...and I'd like to introduce you to my newest sponsor, Fort Worth Fabric Studio! Today Fort Worth Fabric Studio has a wonderful giveaway for one of my readers...this absolutely gorgeous bundle of fabrics! Second, visit the FWFS WEBSITE: http://www.fortworthfabricstudio.com/ then come back and leave me a comment letting me know you visited. Third, follow the FWFS BLOG: http://fortworthfabricstudio.blogspot.com/ and again come back and leave a comment. I think you'll have a wonderful time visiting Fort Worth Fabric Studio...have a great day...and good luck. I'll keep the giveaway open through Monday, April 30th! This bundle is too cute! I love the donkeys/horses in boots. Thank you for a chance to win! I'm very tempted to get some Ford Mustang fabrics as Dan (my husband) is a fan of Mustangs. In fact, he owns a '66 Mustang that he is trying to restore. So cute, perfect for a little boy! I'm now following them on twitter! (I'm shocked that I haven't been following them until now). I just visited the site and I love that they have all the ta dot colors available as a bundle. And I just subscribed to their blog. And followed them on Facebook. Donkeys in galoshes...gotta love it! I love the horses in the rainboots. Adorable! Just in time for my new nephew arriving this September! I visited Fort Worth Fabric Studio's website and signed up for their newsletter while there. I like Fort Worth Fabric Studio on facebook. I am a new follower of Fort Worth Fabric Studio's blog. OMGosh...my garden boots are on this print!! LOVE IT!! Thanks for the chance to win this sweet bundle! Those boots are adorable, thanks for the chance to win! I am checking out their site. I, too, love the bundle that you are giving away!! Love the rainboots! I visited the FWFS shop (as I do way too often - ha ha!). I follow the FWFS blog through RSS. I love those garden boots! Thanks for the giveaway! I follow FWFS on Facebook. I also follow FWFS on Twitter. I now follow FWFS on Facebook. I follow the FWFS blog. The fabrics in the giveaway are really bright and fun, especially the boots. I visited their website but I do that on a regular basis anyway. Great shop and fabulous service! What a cute bundle! Thanks for the chance to win! Whoo hoo what a great give a way... thanks so much for a chance. I visited the FWFS website - it was fun looking through their catalog! This is a great bundle, it's so cute! Thanks for the giveaway chance! Such cute fabric! My grandkids would love this print. I love these fabrics and with many many babies being born to friends and family this year I know I would use it. Thanks for the chance to win. I visited the FWFS website and signed up for their newsletter. They have a great selection. I was delighted to see they still have some Ruby by Bonnie and Camille. I love that fabric line and it's been hard to find any lately. Visited the blog. Love the TaDots and downloaded the free Dresden tutorial. Just visited FWFS. I'll definitely be going back to do some more indepth perusal and purchasing. Great giveaway, I love Fortworth fabrics! I love what she made with the Ta Dots fabrics, cute quilt! Love love love this collection. Can't wait to go check out their website. I follow Fortworth fabrics on facebook! This bundle is so cute! I love the donkeys in wellies. I visited Fort Worth Fabric Studio. Well I don't love a rainy day since I'm right outside Seattle, but I love the prints! Thank you for the giveaway! I visited their website, love it, especially their Friday bundles specials! I am following Forth Worth Fabric Studio's blog. I've visted Fort Worth fabric studio's website, nice reasonable prices on Kona which is always a plus in my book, and they carry Woodland Trails! Love that stuff. I like Forth Worth Fabric Studio on Facebook. I'm following their blog now. I just fellin love with the Citrus Twist fat quarters over at FWFS. Swoon! And I am sooo following their blog now at FWFS. Have you seeeen the Dresden Flowers Quilt? Amazing! This fabric is so adorable! I am a new follower of their blog. I am a new follower of Fort Worth Fabric on facebook. I visited the FWFS website. I follow the FWFS BLOG with RSS! I love the rain boots, how fun! I visited their site. Thanks for the introduction to a great new store! The fabrics are gorgeous. Thanks for the giveaway. I follow on Twitter. My username is deejj. What a fun bundle! THANKS for the chance! I visited their site - great shop! I recently discovered FWFS and ordered from them a few weeks ago. Please consider me - I am horse and welly mad! How darling! Such a cute fabric bundle! That would make a cute boy quilt!!! Thanks for the chance to win this great fabric. I visited their site. What a great selection of fabrics. I could spend a lot of time there just daydreaming. I am now following the FWFS blog. Thanks for introducing me to this great store. Always nice to find a new online fabric shop. The giveaway is just frosting on the cake. Great giveaway. I'll try to win. Sweet bundle, thanks for the great giveaway! Fingers crossed...adorable bundle of happiness there. Oh, that is adorable fabric! Thanks. Oh wow, those donkeys are so cute! Thanks so much! I am already a follower of their blog! I have looked at the Fort Worth Fabric and they have a great selection of fabrics and reasonable shipping. I am following the FWFS blog. They have a really cool tutorial on there today! Thanks. I love this fabric...especially the cute wellies! I liked the FWFS on facebook. Thanks again. I visited fort worth fabric studio. I love that they give back to charities. I'm with everyone else.. those donkeys in wellies are so cute! Thanks for a chance to win this bundle! I liked Fort Worth Fabric Studio on Facebook! I visited their website, and follow the blog. Great fabrics! I already regularly check out their website (and get their newsletter)! Cute! I'd love to win. I love FWFS! I get their emails every Friday about the new Bundle Batch. Fresh, original and fun! I'm a fan! I love shopping on their site. They bundle the fabrics so pretty that it's so easy to figure out what you need. One of my favs is the Dr. Seuss! Great bundle! Thanks for the chance to win! I follow FWFS on FB. Thanks for the giveaway :)!! Cute Fabrics! I follow FWFS on Twitter. LOVE READING YOUR BLOG DAILY! THANKS FOR SHARING YOUR NEAT IDEAS! I visited the store! Love the Caribbean Escape Bundle! SAW SOME BUNDLES THAT I 'NEED'! Bookmarked their site and will visit often. Wish they had a store front since I'm next door to Fort Worth! I follow the FWFS blog! I like FWFS on FB! HAPPILY FOLLOWING FWFS VIA FB ALREAD! Cute fabric! Thanks for the giveaway. Thanks for the chance to win such a fabulous prize!!! HAPPILY FOLLOWING FWFS ON BLOG LOVIN'+YAHOO MAIL ALREADY! THANK YOU FOR SHARING A NEAT GIVEAWAY! The fabrics re so cute! This would make a wonderful child's quilt. I follow FWFS on their blog. I'm on my way to visit them! Oh, great giveaway - I love that fabric. I visited - who knew Yo Gabba Gabba had fabric? It's a grandson's favorite show. Wow what a great rainy day giveaway!! I have my fingers and toes crossed! What a great bundle of fabric! I've liked them on facebook. I love the colors.....and a rainy day! Those fabrics are so cute! A quilt made from them could bring a smile on a rainy day for sure. Thanks for the chance to win! I checked out the FWFS site and see they have fabrics from the Crazy Daisy line. They're on my wish list. Also love the sale section at FWFS. I have ordered from them before and was thrilled with my purchases and the customer service. Love the galoshes and the color combo. Now follow FWFS on Facebook. Really love their online store! What a lovely Fabric Bundle! Especially like the rain boots. I check out the FWFS website and perused their fabric lines. Lovely selection. Thanks for the chance to win such beautiful fabric!!!! What fun fabric, love those boots. I visited their website! I love their "Friday Bundle Batch"!!!! I'm a follower of their blog too!!! Thanks for another chance to win! What a cute bundle of fabric! We've got a new baby boy expected this summer and this would make a fabulous 'boy quilt'. Thanks for a chance. Following them via email. Thanks. I love any fabric Lori Wisbrun designs! I visited the FWFS website and signed up for their great newsletter. I've visited the FWFS website. I'm also following their blog! LOVE the colors in this fabric line! Just for me and my sewing machine!! I love rain! 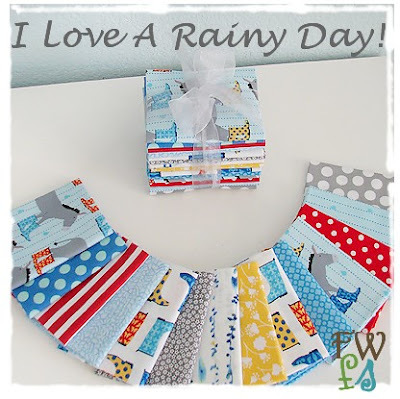 Rian boots, umbrellas....since I live in a drought stricken state, I guess I'll have to sew with theses darling fabrics to enjoy rain! I visited http://fortworthfabricstudio.blogspot.com.ar/ and I´m following! I love the Jack and Jenny prints!